Microphones are a vital part of recording sounds from low bass to high treble. They can make a great performance even better by amplifying sounds that may have otherwise been missed. Microphones can be used to record voices, instruments, and any other sound you may be inclined to record and amplify. The type of mic you choose to use will depend on what your recording purposes are. Whether you’re singing karaoke or performing in front of a live audience, you want a microphone that will make your voice sound as crystal clear as possible. If you were planning on using a microphone for any type of live performance, your best option would be to choose a dynamic mic. Dynamic microphones are ideal for live sound and are great at picking up sounds from instruments, making your performance as great as it can be. These days, many different dynamic mics are available to the general public, making it difficult to sort through them all. How do you know which microphone will work well to serve your purposes? We went through the available options to find what sets some dynamic mics apart from others to help you find the perfect one. These are the best dynamic microphones in 2019. Whether you’re planning on doing a live performance, singing karaoke with friends, or recording something, you’re going to want a microphone that is dependable. This may be easier said than done, simply based on the volume of available microphones. Once you’ve narrowed your choice down to a dynamic microphone, it can still be challenging to decide which one will work for you. Reviews are helpful, but there can be thousands to look through. To help with this vast endeavor, here are the top five best dynamic mics based on customer reviews. The Shure SM7B Vocal Dynamic Microphone has a wide range frequency of fifty to twenty thousand hertz, which makes it great for recording or live performances. 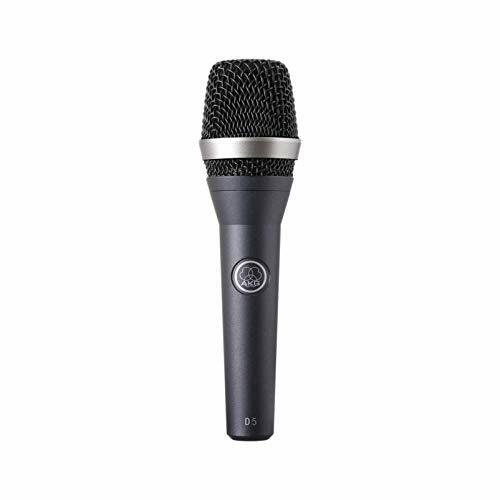 This dynamic mic uses a cardioid polar pattern to pick up both high and low frequencies. This pattern also provides an improved rejection of interference and electromagnetic hum. The mic features a built-in pop filter to protect from explosive breath sounds, so there is no need to purchase any additional protection. It has a durable construction that provides long-lasting reliability. It requires a preamp with a sixty-decibel gain and an XLR connection. This dynamic microphone from Shure comes with a detachable A7WS windscreen to help reduce outside sounds and assist with picking up close vocals. It uses a yoke mount with a captive stand nut, so you have complete control of the mic’s position. 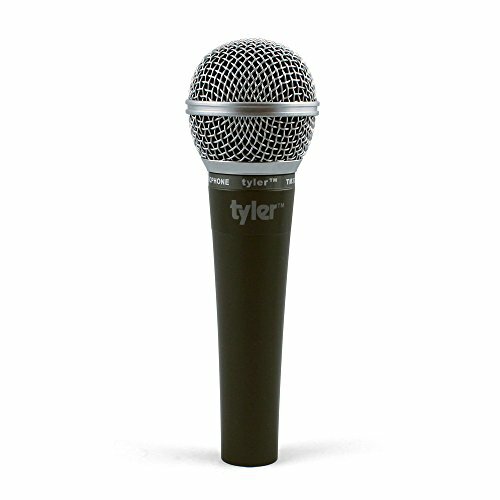 Tyler offers a dynamic microphone that is inexpensive and perfect for any basic mic application. It uses a unilateral cardioid pickup pattern to help block out background noises and emphasize the sounds you want. The moving coil allows for a high gain before feedback, giving this mic a robust sound. The Tyler TM303 Professional Dynamic Handheld Microphone has a metal construction that helps protect it from the wear and tear of constantly being carried around and handled. It is also moisture resistant, which is great if anyone using it happens to be a heavy spitter. 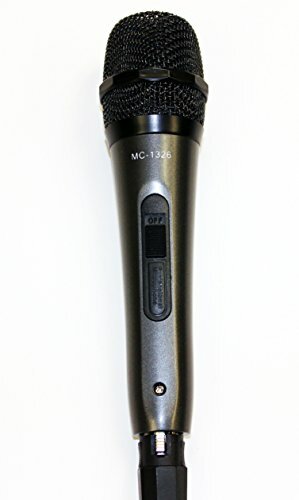 This dynamic mic has a -72dB sensitivity, so it can handle very low sound pressure levels. It comes with a sixteen foot XLR to ¼” detachable connecting cable. It also has a storage bag and a one-year warranty. Behringer’s Ultravoice Dynamic Microphone is a high quality mic with a wide frequency range of fifty to fifteen thousand hertz. It features off axis rejection and integrated noise filter to help eliminate issues with feedback. It also has a cardioid pickup pattern to further assist with eliminating background noise and feedback. This pattern will also help pick up your voice, so you can get the amplification you desire. 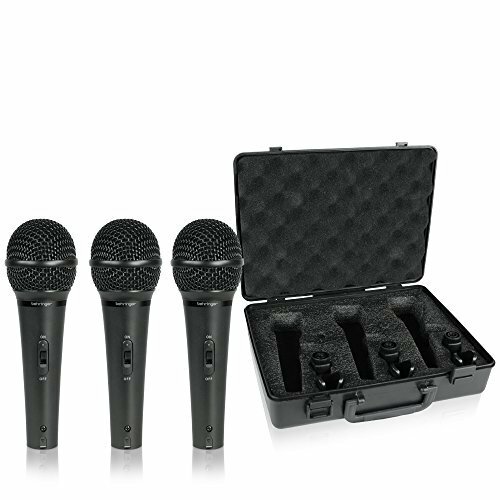 This mic is available in a set of three and comes with an impact-resistant protective case and stand clips. They are built to last through whatever abuse microphones are prone to take when used by multiple people. The mics can be connected to any amp or PA system using an XLR cable. The CAD Audio KBM412 Dynamic Microphone features a frequency range of twenty-five to twelve thousand hertz, making it perfect for low frequency sources. Thanks to its ability to handle high SPLs, it was made to pick up sounds from bass drums and other large diameter percussion instruments. This dynamic mic has a cardioid pickup pattern and a shock mount saddle to help isolate sounds and provide protection from interference. It features a tough build and swiveling abilities, so you can adjust it to the best possible pickup spot. It comes with a mic clip and requires an XLR connecting cable. This mic from AKG is a handheld dynamic microphone that was designed for both lead and backup vocals. It has a very rich sound that delivers a great vocal performance. However, this mic has a frequency range of fifty to fifteen thousand hertz, making it great for other audio applications as well. This mic uses a supercardioid polar pattern to give you the highest possible gain before feedback. It also features an AKG Varimotion diaphragm that can be tuned, so you won’t need any extra tuning resonators. 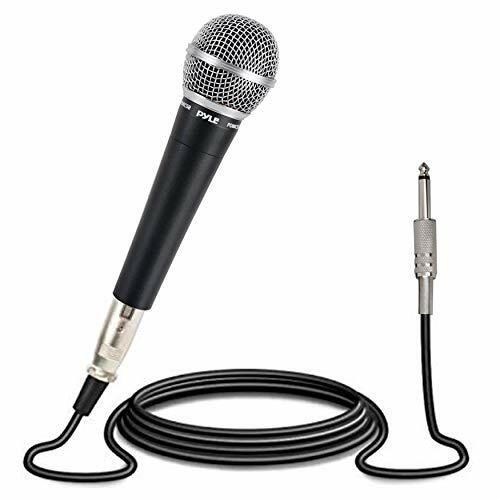 It uses an XLR connecting cable and has a rugged construction for long-lasting durability. What Makes A Microphone Dynamic? Not all microphones are built to handle the same types of recording or amplifying jobs. They come in all sorts of shapes and sizes and can be used for a variety of tasks. Each type of mic has unique characteristics that make it different from other types. This includes dynamic mics. These are a few of the characteristics that cause a microphone to fall into the dynamic category. Dynamic microphones have a higher gain before feedback (GBF) than other types of microphones. This means you can add more amplification to your voice or instruments before getting distracting feedback sounds from the audio system, which is helpful to your overall performance. The decibel level where sound comes back into the microphone and causes ringing or other types of feedback noises is traditionally used to measure GBF. These noises distract from the performance and can have a negative impact on how people react, so having a high GBF is ultimately beneficial to you. Perhaps the thing that stands out the most when it comes to dynamic microphones is the moving coil magnetic diaphragm. The coil is connected to the diaphragm and sits inside a magnet. When the diaphragm moves, the coil also moves. This movement creates a small voltage signal, which converts the sound into an electrical signal and creates the amplification effect. Essentially, the moving coil is what makes dynamic mics work. A dynamic microphone’s moving coil is excellent for capturing sounds reliably. The way the coil is built into the microphone gives it a high durability and allows it to be carried around by hand. It also gives the mic the ability to handle high Sound Pressure Levels (SPLs), which makes these mics great for use with guitars and drums. When deciding which is the best dynamic mic to buy, there are a lot of options to consider. It’s no surprise that some brands are better known than others. These commonly known brands have consistently created some of the top microphones available on the market today. 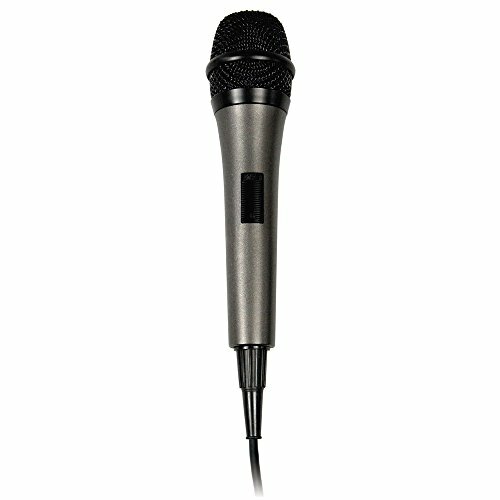 When people hear the word microphone, odds are they picture a Shure mic. Shure is by far one of the most well known audio companies in existence. The company was founded in 1925 as a one-man operation selling radio kits. Over the years, it has experienced various ups and downs, but has ultimately grown into a massive global leader in the audio industry. Shure’s dynamic mics can be found in major recording studios and on some of the world’s biggest stages. It has received several honors and awards, including a GRAMMY award for its contributions to the music industry. S. N. Shure even has his handprints featured in the Hollywood Rock Walk of Fame. Shure’s microphones have a strong history of performance and reliability. This company’s microphones were so well trusted it was commissioned by the U.S. government in the 1940s to make specialized mics for military purposes. Since 1965, its mics have adorned the Presidential lectern. For over ninety years, Shure has been dedicated to making tough, dependable products that last. AKG is another respected company in the audio industry. Dr. Rudolf Goerike and Ernst Pless founded AKG in Vienna in 1947. It didn’t take long for the company to grow and develop into a well-known name in the industry throughout the world. AKG microphones have been used in major world events. Most notably, the mics were used for the “Arctic Northeast” project, which showed how durable they are even in extremely low temperatures. The microphones were also used in the Russian MIR space station, showing just how dependable and trustworthy the company is believed to be. This company has a long and reputable history of making quality products. These products, including dynamic microphones, are used and lauded by musicians around the world. AKG is committed to continuing this tradition of excellence in all of the products it creates. Behringer is a German company that was founded in 1989 by Uli Behringer. He started creating his own equipment because he didn’t have access to the equipment he needed at the university he was attending. Word got out and many students were soon requesting equipment from Behringer, leading to the start of a great company. Behringer has since become one of the largest manufacturers of audio equipment in the world. The company is owned by Music Group, which also owns several other companies and operates in over one hundred and thirty countries worldwide. This company has made great products over the years and plans on continuing to do so for many years to come. CAD Audio began as the Astatic Corporation in 1931 when C.M. Chorpening and F.H. Woodworth set out to develop a static-free microphone for their ham radio transmitters. From there, it grew into a well-known and successful manufacturer of microphones. Both the Army and Navy used Astatic products in WWII, showing how trustworthy the company was and still is. Its products can be found in a variety of professional settings worldwide from restaurants to airports to corporate boardrooms. Astatic formed its Conneaut Audio Devices (CAD) division in 1988 in order to reach a wider customer base. CAD is now the company’s primary developer and manufacturer of microphones for both recording and live performance markets. Audio-Technica was established in Tokyo in 1962 and is not simply one company, but is actually a group of companies throughout the world. This group of companies works hard to manufacture and produce the highest quality audio equipment possible and has delivered just this time and time again. This worldwide corporation has without a doubt established itself as a global leader in the audio industry. Products from Audio-Technica have been used in many major global events including presidential debates. Its products have also become a major part of the Olympic Games, as well as other major sporting events. For over fifty years, it has made outstanding contributions to the industry and continues to do so today. Whether you’re a professional or are using a microphone for personal enjoyment, there are a few important features that all of the best dynamic mics will have. ​Durability: Dynamic mics go through a lot. Often, they are used as handheld mics, which means they get handled frequently and can even be dropped from time to time. A good dynamic microphone will be able to handle all of the crazy wear and tear without losing a beat. Flexibility: The best dynamic mics will be able to handle a variety of jobs. They should be able to pick up a wide range of frequencies, so they can be used to amplify and record all sorts of instruments and sounds. Will not require a power source: Dynamic microphones should never require an input power source. In fact, they should actually generate power through the vibration of the coil. This lack of an external power source allows for a purer sound and prevents interference from external sources. The audio market has a ton of different dynamic microphones to offer. Without question, some are better than others. It’s important to note that just because a microphone is expensive it doesn’t mean it’s high quality. Some of the best dynamic microphones are actually quite inexpensive. It’s better to look at what features a mic has to offer than to be fooled by a high price tag. Finding the best dynamic mic doesn’t have to be complicated if you’re wiling to take a little time. It’s well worth it for such an important part of your live and recorded performances. Once you know what you’re looking for, it becomes a lot easier to narrow down the list of options.